Executives and business owners have the responsibility to their employees, shareholders, partners and families to protect their companies and operations from the legal threats that can haunt Florida businesses. It is important to take proactive measures to limit your exposure to these potential liabilities through the establishment of employment contracts, non-compete agreements, creation of employee policies, employee handbooks and more. With foresight and proper planning, you can help protect your business from future legal or financial troubles. 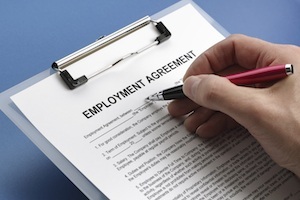 At KALIS, KLEIMAN & WOLFE, our employment agreement attorneys assist employers to help them avoid damaging lawsuits. Our firm has more than 20 years of experience in the areas of analyzing, drafting, negotiating, reviewing and interpreting a variety of employment contract issues. We can also litigate your employment agreement issues including breach of contract, trade secrets, non-disclosure of intellectual property and more, when needed. KALIS, KLEIMAN & WOLFE, P.A works closely with start-up, small and medium sized business owners and entrepreneurs in a variety of employment and business matters throughout South Florida. Our attorneys also serve several businesses as their outside “in-house” counsel. The Corporate Law and Commercial Litigation law firm of KALIS, KLEIMAN & WOLFE pride themselves on not just being lawyers, but being lawyers and counselors. We work with you to understand your business needs and goals and help identify potential employment and business legal problems. We then take the steps needed to protect and limit your company from unwanted exposure to liabilities. If you need assistance with an employment agreement or are faced with a business dispute and need guidance on any contract, contact the experienced Corporate Law Attorneys at KALIS, KLEIMAN & WOLFE, the South Florida-based commercial litigation law firm today at (954) 791-0477.